I have been dying to make my own salad dressing and I finally did it! And it's healthy! And delicious! And makes you want to eat salad! 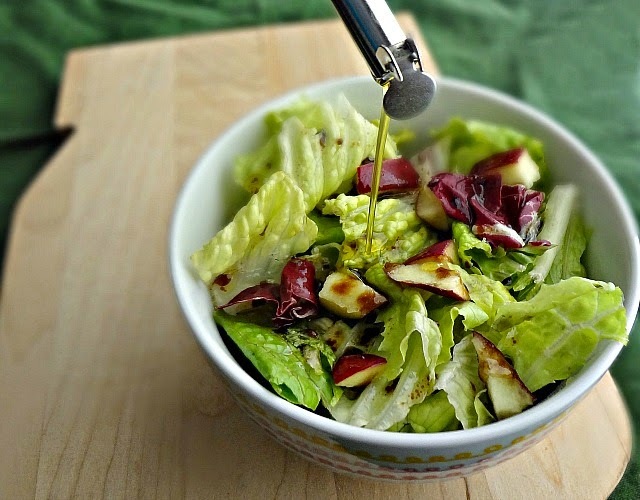 As it turns out it's super easy to make a vinaigrette that is tailored to your own tastes. 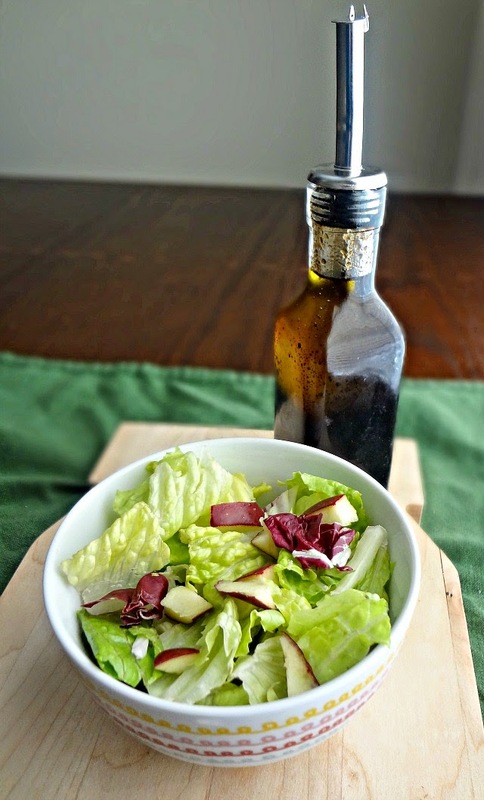 You just need a particular ratio of oil to vinegar/balsamic and then season however you prefer! When I made this dressing I didn't actually need to season it as I had bottles of flavored/infused olive oil and balsamic that I received in the gift exchange with Michael's family. (His cousin lives in Pennsylvania and there's a store there-called the Lavendar Rabbit-where he bought the oils and balsamics. 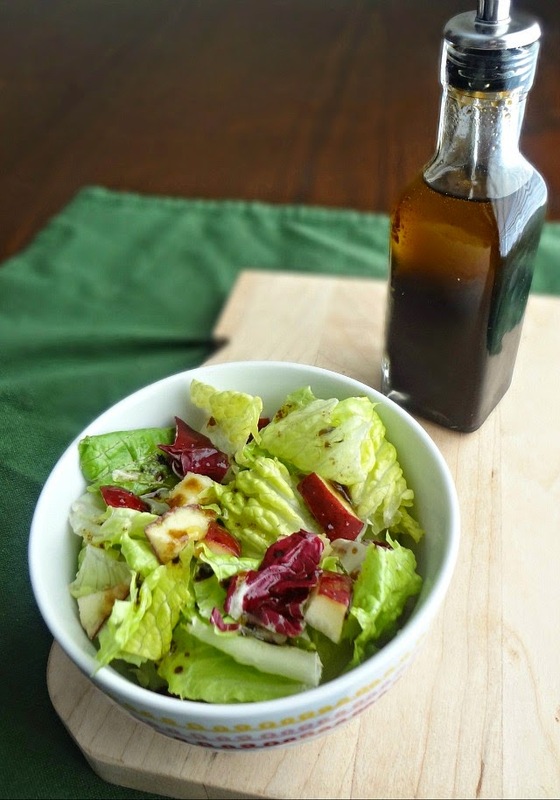 I happen to love salad with apples and garlic-y kind of flavors and, luckily, there was a bottle of Parmesan Garlic Rosemary olive oil and a Red Apple Balsamic! Yum! In the future, since my delicious flavored options are now gone, I'm sure I'll be using some garlic powder and things of that nature to spice it up. So, like I was saying...easy. You just whisk together the ingredients and then pour it into whatever bottle you wish to serve/store the dressing in. And-as long as you don't add any perishable items (such as Parmesan cheese)-you can even store it at room temperature for a month or so. 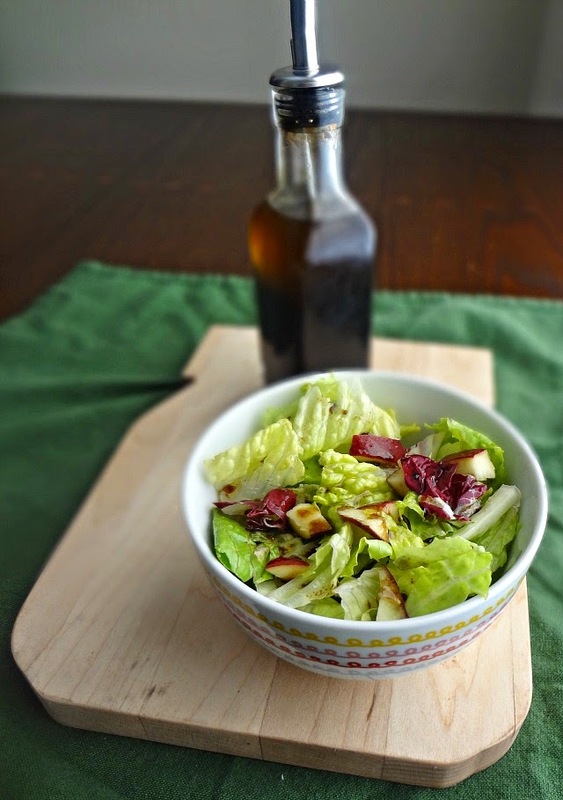 The oil and vinegar will separate so you just need to shake well before drizzling over your favorite salad. Making healthy eating delicious! Optional-seasonings such as minced garlic/garlic powder, dried basil, parsley, rosemary, grated Parmesan cheese, etc.--according to your preference. In a small bowl whisk together the olive oil and balsamic (or shake in a container with a well-sealed lid). Taste and adjust seasonings according to your preference. If using no perishable items (such as if you just use olive oil, vinegar, salt and pepper) store in a sealed container at room temperature for several weeks (can also store in the refrigerator if you prefer/if perishable items are used). Oil and vinegar will separate shortly after being shaken--shake again right before using to recombine. Turns out salad is very photogenic!